The BBC4 documentary Dangerous Knowledge (on youtube and on watchmath), although worth watching, promotes the popular but unfortunate notion that mathematicians are prone to madness. Timothy Gowers recently noted the tendency to portray mathematicians as outcasts on the brink of madness, and a quick survey of films that mention math will likely bear his observations out (in keeping with this trend, I am waiting for a film of the life of Grothendieck). When mathematicians write about themselves, they don't tend to mention madness as an occupational hazard. The role played by social and mental dysfunction seems to be one of the key differences that emerge when we compare what outsiders think about mathematicians and what mathematicians think about themselves. I've been collecting links to the homepages of mathematicians, and have about 95 here. Many pages have links to preprints and other resources. Generally they don't seem to be unstable, but you never know. 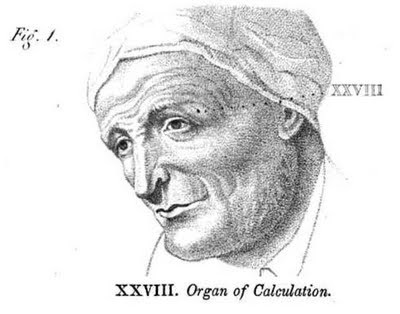 The image at the top of the post was taken from Phrenology, or, The doctrine of the mind (1825), by Johann Gaspar Spurzheim, and purports to show the location of the calculation organ - which may be dangerously close to organs that govern mental equilibrium.